So after all the whinging and gnashing of teeth over the positioning of the Indie channel on Xbox live, this is what we can expect when searching for the most popular indie games on xbox today. Seriously? Mining games only? This is my reward for drilling down three levels of menus? 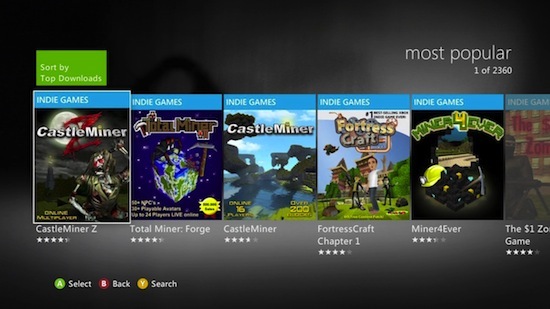 Look, I get that XBLIG can fall prey to trends, just like any gaming ecosystem. Before these mining games we had a litany of FPS’s with Quake, a glut of RTS’s with Command and Conquer, and a torrent of Platformers with Mario. But wasn’t Minecraft and its attendant mods enough? We can only hope that Minecraft releases mod and multiplayer capability for its Xbox release and puts a stop to all this.